Jaime King joined Lily Collins and Matt Bomer for ‘The Last Tycoon’ premiere in LA on Thursday (July 27). I can kind of see the vintage influence she was trying to channel here with this Alice + Olivia Fall 2017 ensemble, which not only plays into her love of retro style but also the 1930s setting of the new Amazon Studio series. 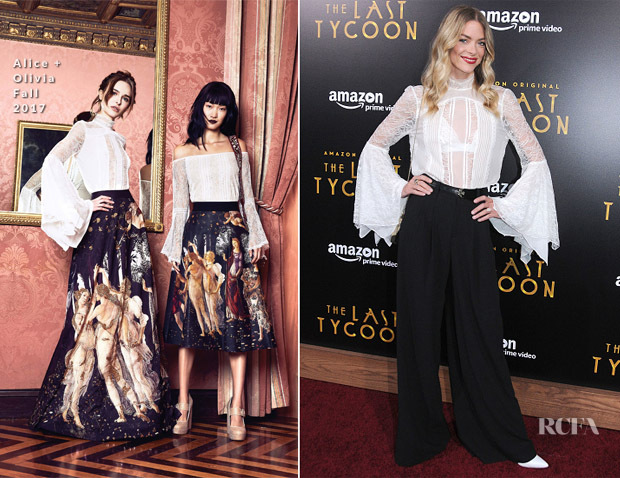 But, I just couldn’t get fully on board with the lace batwing sleeves of her sheer blouse—or the white pumps that peeked out beneath her wide-leg trousers.